"The initial material was an insulator," says Ye. A Ph.D. student from his group heated these devices, which is a tried and tested method to increase conductivity. He noted that the material became very conductive, and its resistance was just one order of magnitude above that of graphene. "So it became an excellent metallic conductor." 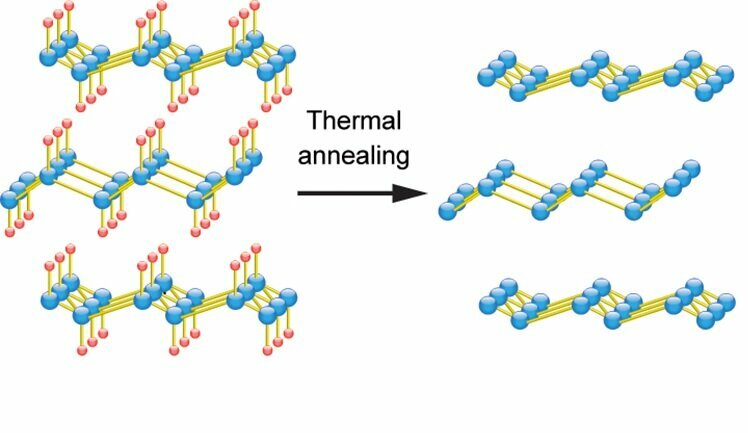 Further experiments showed that moderate heating (up to 200°C) produced semiconducting germanane. Germanene can, therefore, be an insulator, a semiconductor or a metallic conductor, depending on the heat treatment with which it is processed. It remains stable after being cooled to room temperature. The heating causes multilayer flakes of germanene to become thinner—confirmation that the change in conductivity is most likely caused by the disappearance of hydrogen. "The germanium atoms are heavier, which means there is a stronger spin-orbit coupling," says Ye. This would provide better control of spins. Being able to construct metallic germanene with both excellent conductivity and strong spin-orbit coupling should therefore pave the way to spintronic devices.